Gloucestershire moved into second spot in Division Two with a convincing 10-wicket victory against Essex at Garon's Park as James Franklin and Ian Saxelby did an impressive job of dismissing the home side for a second time. Three Essex batsmen passed 30 but no one bettered Graham Napier's 39 as Gloucestershire were left needing 39 for victory. Already three down at the start of play, Tom Westley departed early, caught at leg slip off Richard Dawson, and then the seamers chipped away at the order. Mark Pettini was trapped lbw by Franklin and James Foster drove loosely into the covers. When Ryan ten Doeschate fell an innings defeat hadn't been averted, but Napier and David Masters at least avoided that ignominy. However, Franklin completed a fine all-round game by taking his match tally to six wickets alongside his important century. Robert Croft and Dean Cosker shared six wickets to bowl Glamorgan to their first Championship victory of the season with an innings-and-72-run success against Leicestershire at Colwyn Bay. The spin paring dismantled the visitors shortly after lunch to complete a dominant win following a record performance from Glamorgan's lower order on the third day. 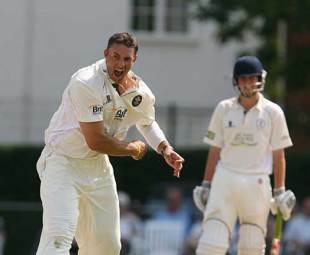 However, it was all about the slow bowlers as Adam Shantry made the early-morning inroads. Leicestershire were already two down overnight and soon lost HD Ackerman leg before then James Taylor was brilliantly stumped down the leg side. Boeta Dippenaar and Tom New held firm for a while and added 67 before the spinners got to work and removed the last six wickets for 18. Croft, following his 121, took two in three balls and Cosker ended the match 20 minutes after lunch. Mark Ramprakash will never be recalled by England, but how they desperately need someone who can churn out the runs he does. His unbeaten 76 helped Surrey build a lead of 223 over Derbyshire at Whitgift School and pushed his average for the season towards 100. Alongside Michael Brown, who followed his first-innings hundred with 52, Ramprakash added 89 for the second wicket as Surrey capitalised on an advantage of 28. The Surrey attack made early inroads in the morning session as Chris Rogers failed to add to his overnight 80 and Andre Nel dispatched Wavell Hinds for 5. Daniel Redfern (55) and Graham Wagg (71) responded with a stand of 105 for the seventh wicket before Nel claimed two more in the tail. Wagg later followed his runs with two wickets in three balls, with left-arm spin instead of his seam-up style, but it is Surrey who can set the pace on the final day. Sussex endured a few nervous moments but an unbroken stand of 109 between Carl Hopkinson and Luke Wright secured a draw against Nottinghamshire at Horsham although they remain precariously close to the relegation zone. The visitors extended their first-innings lead to 222 before putting Sussex back in and when Chris Nash (87) and Ed Joyce guided them to 128 for 1 safety appeared assured. However, three wickets then fell for 12 runs as Samit Patel removed Joyce and Murray Goodwin either side of Nash being leg before to Andre Adams. Nottinghamshire had a sniff of closing the gap on leaders Durham, but the pitch remained benign. Wright played positively to eat away at the deficit while Hopkinson provided sturdy support to ease nerves during the final session. For a full report from Warwickshire against Somerset at Edgbaston click here. VVS Laxman scored his second consecutive Championship hundred as the Lancashire top order piled on the runs against Hampshire at The Rose Bowl. He added 216 for the fourth wicket with Mark Chilton (81) as the visitors built a lead of 150 to set up the chance of a final-day dart at Hampshire's batting. The platform was laid by Tom Smith (95) and Mal Loye (61) who added 142 before Smith edged behind short of his hundred. Loye, who was dropped twice, fell with addition, but that was the peak of Hampshire's day as they laboured for any further success while using nine bowlers. Laxman reached a confident century and Francois du Plessis scored freely until the close, leaving Lancashire the decision of whether to extend their lead on the final before putting Hampshire back in.